Chronic dyspnea is shortness of breath that lasts more than one month. The perception of dyspnea varies based on behavioural and physiologic responses. Overview Dyspnea (Greek dys, meaning “painful,” “difficult,” and pneuma, meaning “breath. Dyspnea is the medical term for subjective experience of breathlessness or shortness of breath. Dyspnea can be acute when it develops over hours to days and chronic when it has been for more than four to eight weeks. Remember As a rule, chronic dyspnea begins with breathlessness on exertion—which, in time, progresses to dyspnea at rest. Dyspnea may be due to diseases in virtually any organ system, whether caused by interference with breathing, increased demand for breathing, or weakening of the respiratory pump. In most cases, however, patients with dyspnea can be categorized into one of two groups: respiratory related dyspnea or cardiovascular related dyspnea. Full blood count (to exclude anaemia): The degree of dyspnea associated with anaemia may depend on the rapidity of blood loss and the degree of exertion that the patient undertakes. Spirometry pre and post inhaled bronchodilator OR full pulmonary function tests (PFTs) if the clinical evaluation does not suggest asthma or COPD. Pulse oximetry during ambulation at a normal pace over approximately 200 meters and/or up two to three flights of stairs. Echocardiography is useful for evaluating suspected left ventricular dysfunction, pulmonary hypertension, and diastolic dysfunction. 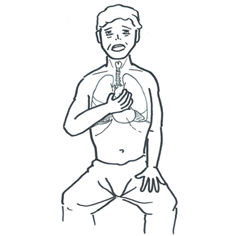 Kussmaul breathing – Diabetic ketoacidosis who manifests with “air hunger”: rapid breathing.